Many people have heard of laser hair removal and thus think that it is mainly capable of destroying hair follicles, but what one should keep in mind is that laser is merely Light Amplification by Stimulated Emission of Radiation and that it produces light that is coherent – each wave is vibrating in the same direction. This makes it less absorbed in the tissue and that can allow us to get acces in layers beneath the top of the skin. By using different energies – or wavelengths – we are able to access the layer we want to and depending on multiple variants we can achieve different results with a LASER light. 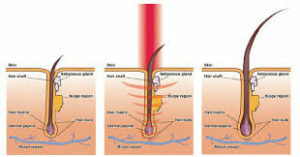 When used in a proper manner laser can be used for hair growth by inducing hair growth in follicles. It has been shown to be quite effective in regrowing hair where it has been lost, due to variant causes of hair loss. You will have to go to a hair restoration clinic to get it done, but the process is usually much less intimidating that having hair plugs implanted, or many other hair loss solutions. If you are completely bald, then this might not be what you are looking for though. For women especially the most common reason for hair loss is that the scalp is too tight and doesn’t have sufficient blood flow. By using a laser to heat the lower layers of the skin we can greatly increase the amount of blood flow in the skin which brings new nutrients to the follicles and induces new growth in dormant follicles. When the follicles receive more blood, they also get more nutrients, vitamins and minerals that are all needed for healthy hair to grow. 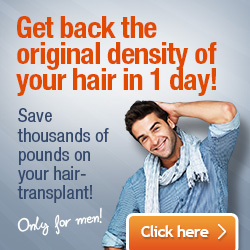 This also makes it possible for someone to grow hair faster and grow better hair. One of the most common types of is the Laser Luce LDS 100(r) that has been shown to be one of the best hair restoration treatments out there. It is a form of effective laser that is known to produce almost an 80% success rate with hair follicles that are in the resting phase. The resting phase is the part of the lifespan of the follicle – it grows new hair for a long time, and then goes in to a resting phase where the hair will fall off. Some follicles tend to stay in this off mode for a longer time than they are supposed to and by using lazer to increase the blood flow in the scalp we can get good results in making the follicles healthier. A normal laser hair restoration treatment takes place at your hair doctors appointment, where you sit in a chair and an circular shape machine is placed on the top of your head. This then flashes bright light in the form of laser to your scalp causing it to heat up just a little, and then increase the circulation resulting in the desired outcome. Another common laser treatment is the Low Level Laser Therapy (LLLT) that is commonly known for its vitalizing qualities. It really makes your hair follicles grow a more healthier hair and it works with the same principles as the other laser therapies. You can also do a home laser hair restoration treatment if you aren’t interested in going to your doctors for it every time. Needless to say that using a laser comb will not be as effective as the Laser Luce LDS or LLLT but when you combine it with the above treatments you can really have great results. 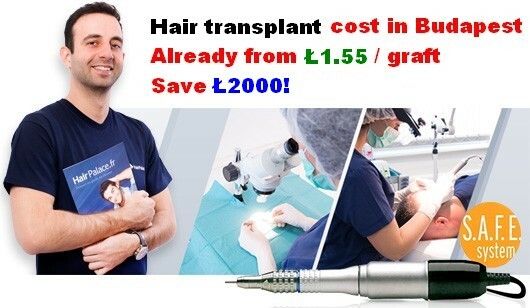 Also if you have had hair implants inserted, then most likely your doctor has already prescribed regular use of the comb to increase the circulation in the area where the follicles have been implanted.